If you've ever attended a well run "live" auction, you've seen the competition and bidding frenzy it can create. Creating a bidding frenzy is a powerful and exciting way to sell real estate in a "live" setting, but doing it online is easier. How do you create an online bidding frenzy? Here are some strategies. Price - Opening bid must be perceived as a great value. Limit Access - By limiting access to the property through scheduled open houses, it forces all buyers to be there at the same time, creating competition. Limit Time - Making the property available for only a limited time creates urgency for the buyer to act. Easy Offers - Allow interested buyers and their agents to bid online from the comfort of their home or office. Open Competition - Allow everyone to see the current high bid. It's easier for a buyer to justify an increase of their offer if it's only $500 or $1000 more than the current offer. 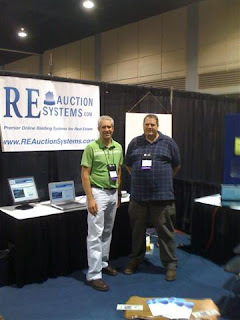 These strategies combined with good marketing are all it takes to succeed with online auctions. I'll discuss marketing strategies next week. Kevin and I had the privilege of attending our first National Auctioneers Association (NAA) Conference and Trade show in Kansas City last week. As an exhibitor, we enjoyed meeting and talking with several auctioneers from around the country as well as attend a couple of the sessions. It was interesting to see how technology is playing a larger part in the auction industry. If an auctioneer wasn't using online bidding yet, they were thinking about it and staying aware of the latest technologies. I think Ebay has done a lot for the auction industry by making the public more open to the auction method of buying and selling. Overall it was a wonderful experience and we look forward to next year.